I recently took part in a very lively discussion on LinkedIn where someone posed the question: For a small company, are cold calls effective? Well this spurred quite a lively debate. ‘Not too shocking, considering it was posted to a group focused on Inbound Marketing. The discussion started off simple enough. With people sharing their experiences and how they’ve effectively been able to use cold calling vs. the content marketers in the group who advocated an end to cold calling entirely. What struck me though was that after a few volley’s back and forth someone asked: What’s a young sales person or company to do when they are not well established in their industry but need to grow their network? Rely on luck? Magic? (I’m paraphrasing). I realized that’s the real problem, isn’t it? 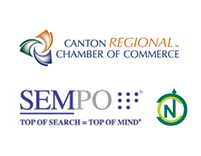 As a local North Canton business, we see our customers in the Akron, Canton, & Cleveland areas all facing the same truth — ‘Traditional’ marketing methods aren’t working like they used to. But at the same time all this ‘fluff’ about content & internet marketing seems like a stretch. So what are we as business leaders to do? But neither approach is satisfying in-and-of itself. Both seem like long, hard (and lonely) paths to generate new business. And there are no guarantees in this world. Traditional sales techniques, content, and inbound marketing tactics all seek to establish the company as a trusted expert in a given area. The problem with cold calling — it’s been devalued as a viable media channel after years and years of abuse by our fellow marketers. The same thing goes for TV ads and Direct Mail with .1% response rates. Hey – we did it to ourselves. Times were good in the 80s-90s though right? That said, these marketing techniques are not as far apart as they would seem. Whether you’re cold calling or content marketing — you need to define your target market. You need to know your audience and speak to their needs. If I’m a new business, I’m taking a look at my existing network of friends, families, teachers, associates, past customers — anyone and every one in my extended network. I then work to create a profile of my ideal client and I research the bajeebers out of people who fit that target. 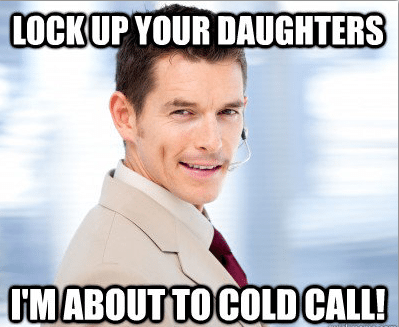 Don’t make cold calls. Make warm calls. Don’t just blog about some generic topic. Understand the questions and challenges your target market is facing and work to answer those questions whether through your company’s website or….I dunno…through a LinkedIn group about marketing. My recommendation — know who you’re targeting. Get inside their head. Work your existing network and say — hey do you know anyone like this? Can you introduce me? Be careful not to abuse your network, but DO cultivate it. Add value. Get creative and put yourself out there with big bold gestures like providing them with a free in-depth report specifically about their business and suggestions on how to improve their lives…but without getting to ‘pitchy’ as we live in a more sophisticated, soft sell world. Remember, cold calling and content marketing are both tactics. They’re sub-parts of your top-level Marketing Strategy. 5) COMMIT to executing on those activities for a set period until it’s time to assess the program’s success. A successful growth strategy incorporates lots of testing and room for failure. So give it time and use this as exercise to build an internal program which will generate leads over and over again. Don’t hesitate to contact us. We’re more than happy to help in any way we can!